Are you a fan of outdoor sports? Let's visit a very beautiful national park in Indonesia. One of the best national parks in the island nation is the Bunaken National Park. To reach Bunaken you have to go to Manado. Bunaken Island area of ​​8.08 km2 is located in the Bay of Manado. 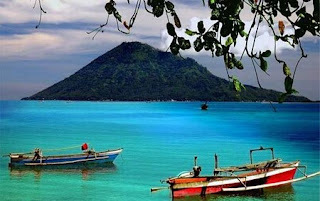 Bunaken is part of the city of Manado, capital of North Sulawesi province. Bunaken has beautiful sea garden. Let's diving in Bunaken. Bunaken is an Indonesian tropical water ecosystems consisting of mangrove ecosystems, sea grass beds, coral reefs, and land / coastal ecosystems. In the northern part consists of the island of Bunaken, Manado Tua Island, island Montehage, Siladen Island, the island of Nain, Nain Island is small, and some coastal areas of Cape Pisok. While in the Southern Cape coast includes some coconut.